This should be resolved in PT 12.8.1, what version of PT are you using ? I've encountered this problem too. If I export an AAF with some subroles muted in the FCP X inspector, protools errors. If I don't mute them, it'll import fine in protools. We work with sources containing up to 16 audio channels, so a fix is really needed. Any updates? We're on FCP 10.4 and 4.2.2 of X2pro. Okey. I have case open with Avid with a case id 03139575 but nothing fruitful hasn't come out of that yet. Last response was that they were not seeing any problem with 12.7.0 non-HD but every system (3 or 4) I've tried does error out on the filtered subroles. I got hold of Pro Tools 12.7 last week and was able to see the same problem that you were seeing. We are now trying to find out what is going wrong. Yes, I have opened up ticket with Avid (last Friday I think), but haven't heard back from them yet. Thank you for the video showing the error. That is interesting to see, and it does make it clearer. Have you contacted Avid about the problem? It would be interesting to hear what they say is causing the problem. Some more info. I downgraded my testing Pro Tools to version 12.4 (non HD) and that version will open both AAF without errors, so the error causing behaviour comes with Pro Tools 12.7 (possibly with 12.5, haven't had a chance to try that). However, on HD Pro Tools, the error was present on 11.x system. Last Edit: 2 years 2 months ago by yogi. Thank you for providing those files. 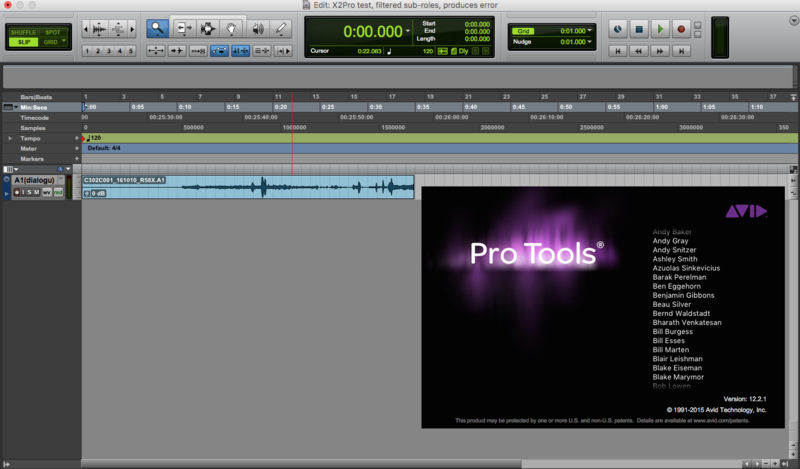 I was able to open the "produces error" aaf in Pro Tools 12.2.1 with no problem (see attached screen grab). Can you please try opening it in Pro Tools on another system? Can I send a link to that material to you directly as I rather not post the media (the referenced picture media is within the zip) on open forum. Thanks.